Let’s talk about MiroPure 2 in 1 Ionic Hair Straightener Brush Review today. How i got in love with this amazing hair straightening brush. And why you will be in love too? It’s all about the amazing features you are getting in MiroPure hair straightener brush. So, let’s start the review and let me show you what amazing features this brush gives you, what good and bad points it has and more. Color Tip: MiroPure hair straightening brush is available in two different colors. Get that hair straightening brush in Matte Black or Golden Pink. Matte Black looks more attractive to me, so i got one. But that doesn’t end this here, let’s have a deeper look into these features. The first amazing feature in this brush is it’s amazing LCD Display combined with multiple buttons. The LCD Display shows you the temperature your brush is working on. And with buttons you can choose your desired temperature settings from a list of 16 different. Available from 150℃/302℉ to 230℃/446℉ makes it perfect for every hair type. MiroPure hair straightening brush is made of the plastic, in that way it don’t burns anything when it gets heated. And the metal ceramic heater it uses, shoots the temperature quickly and distributes it rightly. What helps to getting into the short roots is it’s shape. MiroPure has a shape of the head which is rectangular. And that makes this straightener brush unique in the market. The size of this hair straightening brush is really small, and that makes this brush ideal for travel. And easy to carry it in your bag. The dimensions of MiroPure is 12.6 x 2.8 x 3.2 inches. And the total weight of it is 12.6 ounces. There is also a hand-carrying case that comes as a gift with MiroPure. This hand-carrying case lets you take the brush with you more easily. At last, the heat resistant glove that is included in the package, it protects your hand from burning. Now let’s dive further into the MiroPure straightener usage. What amazes most of the people is it’s quickly heating technology. MiroPure straightener brush heats up very quickly so it won’t be wasting any time of yours. The maximum temperature of MiroPure goes up to 446℉ degrees, and it gets to it maximum temperature only in 60 seconds. Miropure does also comes with a rotating cord, which rotates a full 360 degrees ensuring tangle-free, easy operation. The hanging hook in this brush helps you to put it in a hook more easily. Makes it more easy to store and more easy to pick it up. 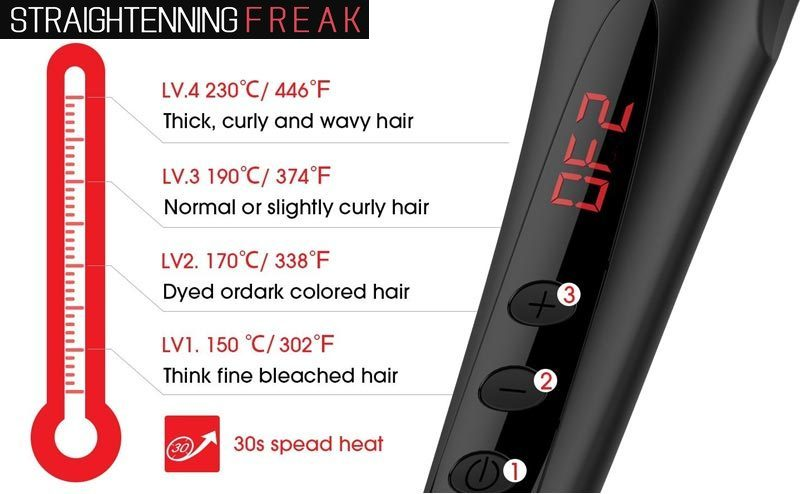 The 16 different temperature settings of this straightening brush makes it suitable for every type of hair. Whether your hair short or long, curly, wavy frizzy, thick or thin, it will work. Miropure ionic hair straightening brush also comes with an anti-scald design. And through this, it helps the bristles to get to your scalp and helps each hair. The double anion spray used in it, it emits negative ions that makes the hair shiny and smooth. Added security feature in it is auto shut-off feature. Which lets this brush shut off after 60 minutes of no use. And the temperature lock function won’t let the temperature change. Miropure straightener brush is specially made for European and North American market. And it runs on the dual voltage, 110-240 volts AC at 60 Hz. To plug into American outlets, you will be simple needing an adapter. The buttons located on miropure is easy to view and understand. The total count of buttons is 3. (+) button increase the temperature and the (-) button decreases the temperature. And the third button is power button to turn on or off. 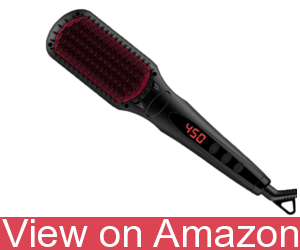 The bristles of this brush is anti-scald made of high density, it provides more control over your hairstyle. The only downfall you will feel and i felt is that miropure takes time to adjust the temperature, and you need to think about selecting the right temperature from 16 different. And it needs more shots for thick-frizzy hair. Takes time to adjust the desired temperature. 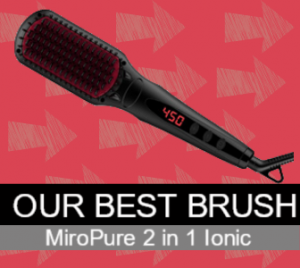 The conclusion of all these features, pros and cons and the deep MiroPure straightening brush review tells us that MiroPure 2 in 1 Ionic straightening brush is a piece of art. And a complete tool for straightening your hair. Thanks to the wide range of temperature settings and protective measures it includes. Thanks to its small size which lets you to keep it with you even while travelling. And an easy LCD that gives the perfect temperature display. Who doesn’t love additional items and special thanks to the hand-carrying case and a heat protecting glove that comes with Miropure. The matte black look of this brush attracts me more. And when combined with perfect results being given because of the built-in ionizer, this tool is love. The ionizer helps us to get even more perfect results and shiny hair. So we can call Enhanced Miropure 2 in 1 Ionic straightener brush as a complete, lightweight, useful tool that gets us the perfect results. Try it out and leave me a comment about what do you feel about Miropure. And what cons you find about this brush.